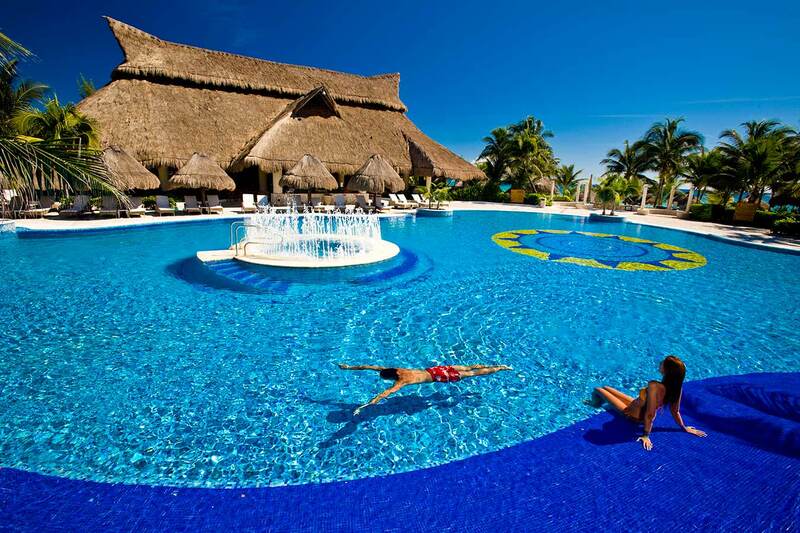 Catalonia Royal Tulum Resort - Adults Only - Save & Book Here! A dream location, posh amenities and exceptional hospitality are all part of the Catalonia Royal Tulum experience. At this adults-only, all inclusive resort there is something for everyone. If you’re looking to relax, try lounging on one of the beds that surround the large pool or in one of the nearby jacuzzis that have great views of the Caribbean. Or if looking for something more active take a dance lesson, water aerobics class or join in a game of beach volleyball. In between it all enjoy fine dining at one the seven restaurants or a delicious drink poolside. The rooms provide a welcome respite and promote relaxation with 24-hour room service, a furnished terrace or balcony, bathrobes and slippers, pillow menu, WiFi, cable television, air conditioning, a mini-bar, coffee maker, iron, hairdryer and a safe. Upgrades are available for larger rooms with preferential access to parts of the resort and discounts on services at the spa. Stop by one of the two restaurants offering buffet and a la carte options for breakfast and lunch. All day long snack food like pizza and sandwiches are served up at the Deli Pizzeria. For dinner try the cuisine at the Mexican, Italian or Asian restaurants, share bites with friends at the Terrace Tapas Lounge or try freshly grilled meat at the Royal Grill. The 3 bars serve up a variety of options for drinking and dancing. Enjoy a delicious fresh juice from the beach bar, sip some tequila, enjoy a margarita and dance the night away at the disco lounge Zen. A personal consultant can help you decide which treatments to indulge in at Spa Alegria. Choose a facial, massage, reflexology or splurge on a spa package and enjoy a little bit of everything. Treatments for couples and just for men are also available. Say ‘I do’ in one of the most stunning settings available. Intimate ceremonies for two and lavish events that include friends and family are all given individualized attention and support. Contact us to find out more about available wedding packages. Schedule a business meeting or event for up to 300 people in the Tucan reception room. Contact us for group rates and details.